Ancient travellers wrote about the beautiful capital city of the kingdom of Siam. Frenchmen from early 16th century reported the splendor of the temples and palaces they saw which to their mind (in the ultimate praise) even rivaled Paris. I can understand why. There are many reasons people travel to Bangkok: for its beaches, its night life, its food, and for bargain shopping. I am here for business, but in the few hours I had to myself today, I used well. The Grand Palace in the heart of Bangkok with its revered Emerald Buddha temple is a sight to behold. I have never seen so much gold-leaf all at one place in my life! Like in Bali, I noticed a lot of common symbolism in the temples and palaces here with Hindu temples in India. 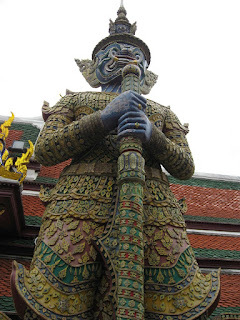 While Thailand is predominantly Buddhist, their temples are adorned with mythical figures of monkey-men, frescos depicting scenes from the Ramayana (while Rama's name has remained unchanged, Ravana has a different name here signifying his ten heads). Many have names with Sanskrit origins (my guide's name was Aranya). The Thais love their king and the royal family. My guide spoke with reverence every time she mentioned the king. Called Rama IX, he is the longest reigning Thai monarch and the world's longest serving head-of-state. The king's elder sister had recently died and there were signs of mourning (the colors white and black are both used to signify mourning here). Local visiting the Grand Palace could therefore be easily identified today by their black and/or white clothes. The temple of the Emerald Buddha is apparently the most sacred one among the 140 temples scattered around this city of 10 million people. The statue is only 16 inches tall and made of jade (and not emerald!). 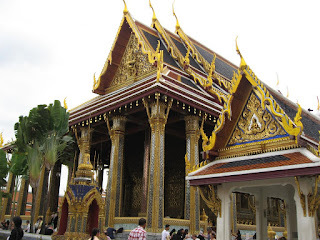 In the Grand Palace I could see a lot of influence from neighbouring Cambodia and China. Porcelain and ceramic tiles with designs that are distinctly Chinese, and some rounded temple-tops such as those in Cambodia intermingled with the local architecture. 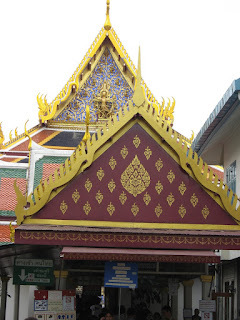 There are also some structures which have been built to European specifications but with Thai adornments on the roof. One of the interesting things here is a detailed, scale model of the Angkor Wat temple. Amazingly, Thailand is the only Southeast Asian state that avoided colonial rule! My guide atributed that to the skillful diplomacy of the then king of Siam who she and her people hold in very high esteem for this reason. 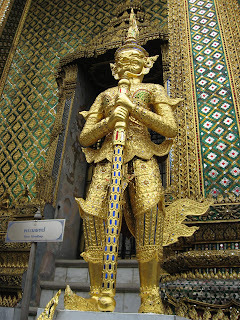 The tour of the Grand Palace will take about two hours. The mornings are more crowded then later in the day, but for good reason: it can get pretty hot and humid during the afternoon. Also note that shorts (for men) and strappy dresses (for women) are not allowed. 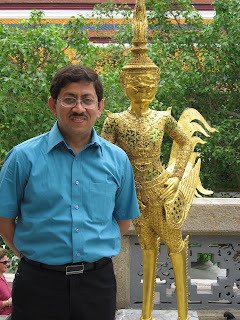 Photography is not permited within the temple of the Emerald Buddha and a few other places. I took a midnight flight from San Francisco to Singapore; sadly, Singapore Airlines has their new cabins only in the 777s and the A380s, but this one was a 747 which has the older Space Beds. But the flight wasn't too bad! Changi Airport now has a brand new Terminal 3. I had over six hours to spend at Singapore; Singapore Airlines had provided me a hotel near Orchard Street, but when I realized there was a new Terminal with its own Business Class lounge, I decided to check it out instead and save myself the trouble of travelling out of the airport and into the downtown area. A shower and a shave is so very refreshing after a long flight! This is why I love flying via Singapore or Hong Kong (unless I am flying Virgin Atlantic via London, that is!). Nothing beats having a shower room in the lounge. I felt human again and went about discovering the new SilverKris lounge with it’s mood lighting, large flat-screen TVs, magazines and food. Finally, I settled down to blog over the free Wi-fi link. The hours passed by fast. There was plenty of food to nibble on: (sic) Biryani rice and chicken briyanni (! ), fish ball noodle soup, chicken wings, pork-ribs soup, bread and orange pudding with vanilla sauce, warm raisin scones with fresh cream and raspberry jam, etc. All of it felt fresh! 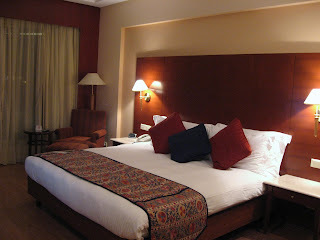 I was back at the Grand Maratha in Mumbai for the night. 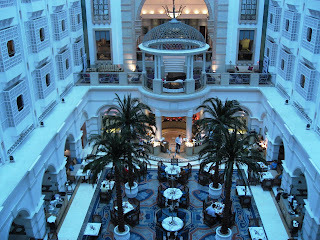 The pictures here are of this hotel’s impressive atrium with its coffee shop amidst potted palm trees. Makes for a wonderful setting to enjoy the buffet breakfast as I check out the Times of India again after two weeks. It's good to be back home again! 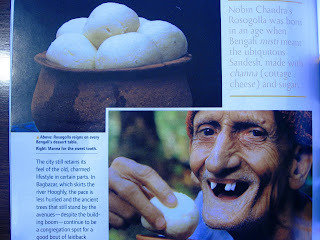 Some time back I had blogged about the Rosogolla and how shocked I was to discover it had originated in Orissa. 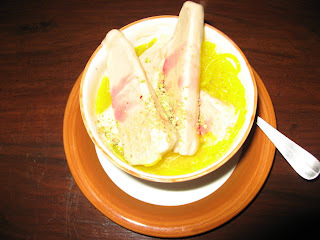 That post gets a lot of hits even now, and if you re-visit it you will notice a fierce debate (in the comments section) between the Bengali and Oriya camps, both of whom lay claim to this popular sweet dish. "It was during the British colonial days that the rosogolla suddenly appeared as an item on Bengal's platter... To trace it's origin, one has to travel to the Bagbazar area in Kolkata's northern part. Nobin Chandra Das, the man who invented the rosogolla, lived in Bagbazar for more than a century. He was poor and fatherless and his meagre income, from selling sweets in a ramshackle sweet shop, was the only source of sustenance for him and his widowed mother. Little did he know that one day he would become a legend..."
"Nobin Chandra's rosogolla was born in an age when Bengali mishti meant the ubiquitous Sandesh made with channa and sugar. As was the trend, Nobin Chandra also made Sandesh but he itched to do something new. He decided to experiment by using the same channa to make a sweet, but by boiling it in sugar syrup. Many of his attempts ended in failure, as once put in sugar, the cheese crumbled. He found that the boiling syrup had to be kept at an even temperature to let the casein stay intact. And on one fine day in 1868 the Rosogolla was born." 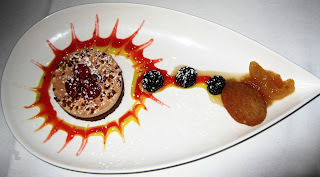 "But contrary to belief the sweet was not an instant hit... The rosogolla took its first few steps towards fame, when luck, in the form of businessman Bhagwandas Bagla, visited Nobin Chandra... At first the rosogolla was popularized by non-Bengalis and found a wider market when his son KC Das expanded the business"
This week I read Chitrita Banerji's evocative book on Indian cuisines, Eating India. 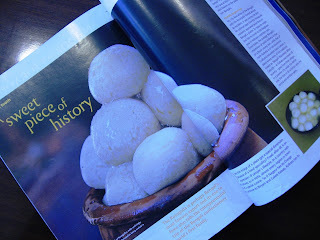 About the Rosogolla, she writes, "It is supposed to have been invented (perhaps through a happy accident) by a nineteenth-century confectioner named Nobin Chandra Das, whose son, K.C.Das, opened the eponymous Calcutta shop in the 1930s..."
But then it gets interesting, "Like most Bengalis, I had always assumed that these and other channa-based sweets had evolved out of the regional imagination, until I came across the theory that the Bengalis had learned to make them from the Portuguese who settled around the Bay of Bengal in the 17th century." Chitrita is a skilled writer and made the Bengali in me very nostalgic with her evocative descriptions of elaborate Bengali feasts and forgotten delicacies. Her research throws up the idea that channa was never used in ancient India, because the Hindus believed that deliberately 'cutting' or spoiling milk of the sacred cow by addition of acid is a sin. Apparently, the paneer only came to India with the Muslim conquerors from western and central Asia (and was never offered to Hindu gods). 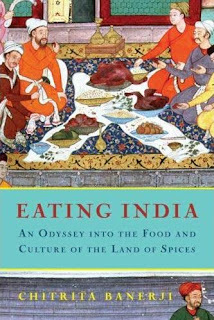 She finds evidence of channa in Bengal only after the 18th century, during the same period when travellers wrote about the skilled Portuguese confectioners in Bengal, many of whom had settled here and married locals. Interestingly, she was unable to find any trace of channa-based sweets in Goa, which was the Portuguese's primary stronghold in India. While the rosogolla's origins seems to be a matter of myth now (check out the wiki debate), there is no denying the pleasure of ending a Bengali meal with these spongy white delights! Newsweek's has a recent cover story on how Tokyo beat out Paris and New York to become the best restaurant city in the World. 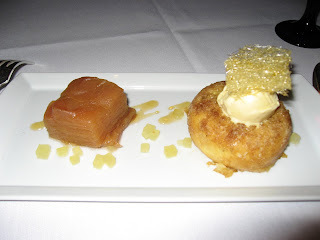 Readers of my blog would have read about Michelin awarding Tokyo an astounding 191 stars (posted here). About a third of all TV broadcasts in Japan are devoted to food. 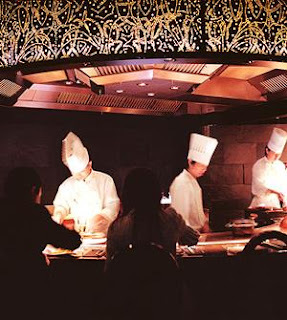 Tokyo has 160,000 restaurants, compared with 13,000 in Paris. Japan food bloggers are hugely prolific, cataloging their meals in painstaking detail (and, often, with cell-phone photos). One housewife whose blog documents her quest for the country's best bread proudly notes that she's visited 384 bakeries in the city of Kobe alone. Sukiyabashi Jiro's 82-year-old owner, Jiro Ono, has spent the past 50 years perfecting his sushi technique. 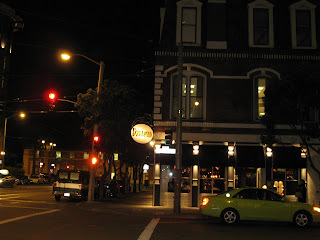 "I've only been there once but I was stunned," says restaurant critic Jun Yokokawa. "It's the ultimate sushi." Ono meticulously controls the temperature of each type of fish he uses, in order "to bring out the best in each," and is famous for wearing gloves whenever he leaves the restaurant, even in summertime, to make sure he never loses his magical feel for fish. His restaurant is all about the food; if you need to use the amenities, you'll have to go next door. 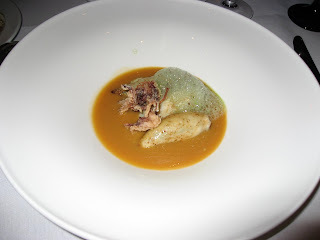 Just because Ono got three stars, notes Michelin's Naret, he's unlikely to add toilets any time soon. At two-star Kikunoi, the water to make fragrant dashi broth is trucked in several times a week from a well owned by the restaurant's parent establishment in Kyoto. The bonito flakes that flavor the soup come from fish caught off the southern island of Kyushu and are carefully sliced to a thickness of one third of a millimeter. Another ingredient, top-quality kombu kelp from Hokkaido in the north, is dried in temperature-controlled storage, then in the open air, for more than a year before it makes it to Tokyo. Such obsession and intensity! It's no surprise that Tokyo is where the serious foodie is now headed. Update: And now the Washington Post profiles a Michelin-starred chef in Tokyo here. Amazing stuff - read this to understand the lengths some Japanese chefs will go to in order to make the perfect meal. 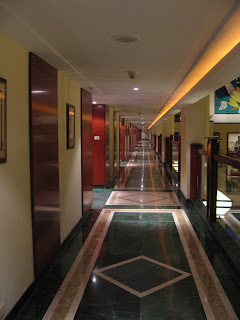 Intercontinental Grand is one of the several five-star hotels that have come up near Mumbai's international airport. 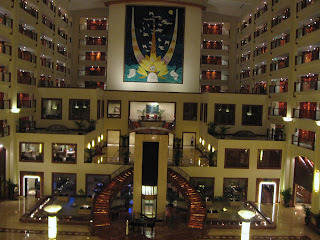 The interiors are very classy with warm colors and a large atrium which goes all the way up (about 10 stories high). 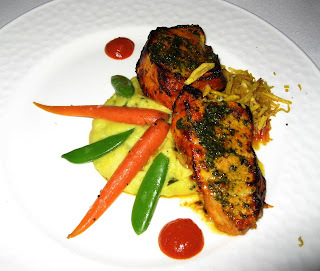 This hotel features multiple restaurants of which Trendz is probably the most popular and serves world cuisine. However, I wanted to try the North-west frontier cuisine at Baluchi, especially their Doodhia kabab of which I had heard so much. Since I was alone, the only way I could taste more kababs was by ordering a sampler. They honored my request to include the Doodhia Kabab and the Barra Baluchi. The Doodhia is a delicate kabab made of two round slices of paneer (cottage cheese) with a thin layer of potatoes and aromatic spices. 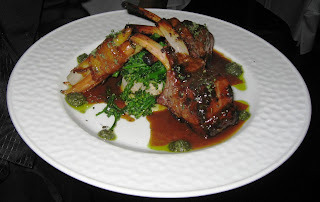 The Barra Baluchi are lamb chops spiced and cooked on a charcoal grill. My sampler also included the Afgani Jhinga Zarad Masala - crunchy jumbo prawns marinated with yellow chillies, fine herbs and spit roasted, and the Dum Murgh Tikka Baluchi - chicken marinated with pureed almond cream cheese and cooked in an oven. The Doodhia lived up to the hype - one of the rare vegetarian kababs I would recommend to anyone! 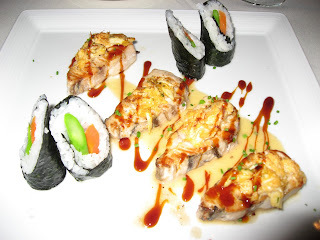 The prawns were a little disappointing; they were slightly over-cooked and I have had better. 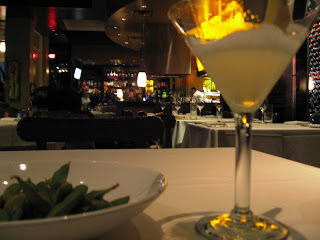 The Barra Baluchi was fantastic! Few can make barra kababs this well. The Dal Baluchi on the side was pretty good too and pleasantly different from the Dal Bukhara imitations found everywhere else. 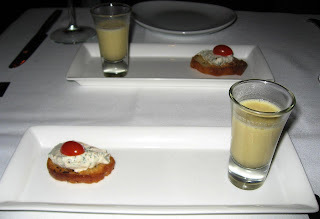 I went straight to desserts after this and ordered a Malai Kulfi which was served on falooda. The Sula Chenin Blanc went rather well with this meal. 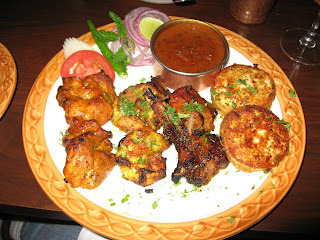 For those who want to try some curries, I recommend one of the following: Dum Nalli Ka Gosht - baby mutton marrow prepared with hot and sour tomato gravy, Pasliyon Ka Salan - a curry of succulent lamb ribs, and Kheema Pasanda Gosht - hand pounded meat-sheets rolled with fresh mince and cooked delicately on dum. Baluchi also has a good selection of exotic Indian breads such as the Taftan, Methi Khaimiri Roti, and Ulte Tawa Ka Paratha. However, their dessert menu is nothing special. To summarize, this is a great place to visit if you love lamb. 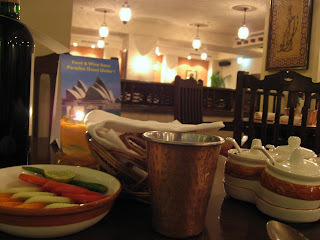 The variety and quality of their lamb kababs and curries certainly exceeds expectations. If you have an appetite for something different, also consider ordering the Peshawari Chappli Kabab, which is minced forcemeat with grated pepper cooked on a griddle. This is a delicacy from Pakistan but rarely made in India. 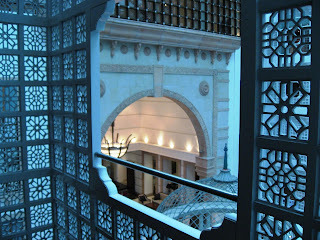 As for the hotel itself, the Intercontinental Grand has excellent rooms and everything else a business traveller needs. The only grouse I had was with the front desk staff. On the day I was there, they seemed to be staffed with a bunch of interns(?) and the check-in/check-out process took very long.